Sloths mate between Semptember and November, which is the dry season in the atlantic forest. The pregnancy lasts for six to eleven months and results in only one offspring per year. 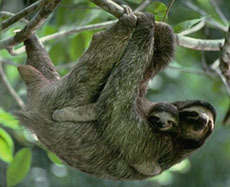 The sloth gives birth hanging upside-down in a tree, and the newborn sloth crawls up onto its mother's stomach. The newborn sloth is born already very well developed. Born at 340-400 grams, they already have open eyes, hair, teeth, and claws. They already have the ability to vocalize and grasp objects firmly; sloths have been witnessed hanging from tree limbs at only 25 days of age. The offspring crawls onto its mother's stomach with its claws directly after childbirth, and stays there for approximately six to eleven months while its mother protects and nurtures it. The offspring is weaned, or accustomed to to foods other than its mother's milk, very early after birth. Within two to four weeks of age, they are able to eat solid foods. Mother sloths can be protective, or can be very neglecting. Mothers have been known to hiss and claw at potential threats to protect the baby. However, baby sloths occasionally fall from their mother, and though the fall rarely kills them the mother often does not come down to get them. The baby will stay on his mother's stomach for months, always keeping at least one foot on her while reaching for leaves and food, until finally the mother simply moves to another area.